In the event of an influenza pandemic, employers will play a key role in protecting employees’ health and safety as well as limiting the impact on the economy and society. Employers may experience employee absences, changes in patterns of commerce, and interrupted supply and delivery schedules. Proper planning will allow employers to better protect their employees and lessen the impact of a pandemic on society and the economy. Absenteeism—A pandemic could affect as many as 40 percent of the workforce during periods of peak influenza illness. Employees could be absent because they are sick, must care for sick family members or children if schools or day care centers are closed or are afraid to come to work. Change in patterns of commerce—During a pandemic, consumer demand for items related to infection control is likely to increase dramatically, while consumer interest in other goods may decline. Consumers may also change the ways in which they shop because of the pandemic. Consumers may try to shop at off-peak hours to reduce contact with other people, show increased interest in home delivery services, or prefer other options, such as drive-through service, to reduce person-to-person contact. Interrupted supply/delivery—Shipments of items from those geographic areas severely affected by the pandemic may be delayed or canceled. How Influenza Can Spread Between People? Influenza is thought to be primarily spread when infected people cough, sneeze or talk, sending infectious droplets into the air and into contact with other people nearby. To a lesser degree, human influenza is spread by touching objects contaminated with influenza viruses and then transferring the infected material from the hands to the nose, mouth or eyes. As an employer, you have an important role in protecting employee health and safety, and limiting the impact of an influenza pandemic. Be aware of and review federal, state and local health department pandemic influenza plans. Incorporate appropriate actions from these plans into workplace disaster plans. Prepare and plan for operations with a reduced workforce. Work with your suppliers to ensure that you can continue to operate and provide services. 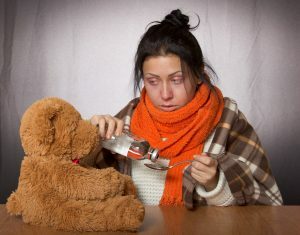 Develop a sick leave policy that does not penalize sick employees, thereby encouraging employees who have influenza-related symptoms to stay home so that they do not infect other employees. Recognize that employees with ill family members may also need to stay home to care for them. Identify possible exposure and health risks to your employees. Are employees potentially in contact with people with influenza such as in a hospital or clinic? Are your employees expected to have a lot of contact with the public? Minimize exposure to fellow employees or the public in the event of a pandemic. This may include telecommuting, staggered work shift, and/or increased use of email, telephone and other technology to avoid close person-to-person contact. Identify business-essential positions and people required to sustain business-necessary functions and operations. Prepare to cross-train or develop ways to function in the absence of these positions. Plan for downsizing services but also anticipate any scenario that may require a surge in your services. Stockpile items such as soap, tissue, hand sanitizer, cleaning supplies and recommended personal protective equipment. Make sure that your disaster plan protects and supports your employees, customers and the public. Be aware of your employees’ concerns about pay, leave, safety and health. Informed employees who feel safe at work are less likely to be absent. Identify a central team of people to serve as a communication source during a pandemic so that your employees and customers can have accurate information during the crisis. Work with your employees and their union(s) to address leave, pay, transportation, travel, child care, absence and other human resource issues. Work with your insurance companies and state and local health agencies to provide information to employees and customers about medical care in the event of a pandemic. Educate and train employees in proper hand hygiene, cough etiquette, other flu prevention strategies and social distancing techniques. Encourage all employees to get a seasonal flu vaccine in accordance with the Centers for Disease Control and Prevention recommendations. Understand and develop work practice and engineering controls that could provide additional protection to your employees and customers, such as: drive-through service windows, clear plastic sneeze barriers, ventilation, and the proper selection, use and disposal of personal protective equipment. Encourage sick employees to stay at home. Encourage your employees to wash their hands frequently with soap and water or with hand sanitizer if there is no soap or water available. Also, encourage your employees to avoid touching their noses, mouths, and eyes. Encourage your employees to cover their coughs and sneezes with a tissue, or to cough and sneeze into their upper sleeves if tissues are not available. Employees should avoid close contact with their coworkers and customers (maintain a separation of at least 6 feet). They should avoid shaking hands and always wash their hands after contact with others. Provide customers and the public with tissues and trash receptacles, and with a place to wash or disinfect their hands. Discourage your employees from using other employees’ phones, desks, offices or other work tools and equipment. Minimize situations where groups of people are crowded together, such as in a meeting. Use email, phones and text messages to communicate with each other. When meetings are necessary, avoid close contact by keeping a separation of at least 6 feet, where possible, and assure that there is proper ventilation in the meeting room. Promote healthy lifestyles, including good nutrition, exercise and smoking cessation. A person’s overall health affects their body’s immune system and can affect their ability to fight off, or recover from, an infectious disease.